(Newser) – More ominous developments in Crimea: Armed men have blockaded two airports in the peninsula, a day after pro-Russian gunmen took control of the regional parliament building. There are conflicting reports on who the airport gunmen are and whether they have actually taken control of the airports. At the airport in Simferopol, the Crimean capital, dozens of gunmen in unmarked military uniforms have been seen patrolling the area. 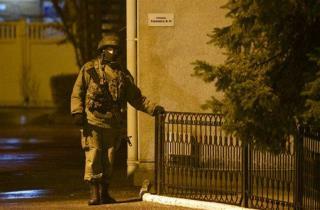 "We are checking to make sure that no radicals come to Crimea from Kiev, from the Ukraine," one gunman told reporters. Flights there appear to be operating normally, CNN finds, but the Wall Street Journal reports that the other airport, Sevastopol's Belbek Airport, has been closed. Ukraine's interior minister blames Russian military units, calling this "a military invasion and occupation," the AP reports. Ethnic Russians are a majority in the Ukrainian region, which is home to Russia's Black Sea fleet, and the US has told Russia to show it is sincere about its promise not to intervene militarily, Reuters reports. "We believe that everybody now needs to take a step back and avoid any kind of provocations," John Kerry said. Ukraine's parliament also passed a resolution today demanding Russia cease any activity that could be considered an attack, CNN reports. Ousted Ukrainian leader Viktor Yanukovich, meanwhile, has surfaced in Russia, still proclaiming himself to be Ukraine's legitimate president. At a press conference today held in a Russian city near the Ukraine border, he insisted he was "not overthrown" but was forced to flee Ukraine in fear for his life, the BBC reports. He called the current parliament "illegitimate" and promised to continue fighting "against terror and fear." In Simferopol, it's not clear whether gunmen are still in control of the regional parliament building, though what the New York Times calls a "well-orchestrated power grab by pro-Russian forces" appears to have taken place across the city. Legislators held a session after the building was occupied and voted to hold a referendum this May that will decide whether to declare Crimea sovereign. CNN says the government buildings in Simferopol were still "under siege" today. (R) 2016 Gov. RICK PERRY Report: Unlike the previous decade's Russia's Georgia invasion. We, the American Republicans are not surprised at a Russian Putin's petty action in Crimea region, because (D) Barack Obama himself loves this kind of US-South Korea Drills ambition all the time, they (Obama's Pentagon) say the Drill is scheduled already. Anyway, our American Republican's response to the MOST-WANTED criminal President Viktor Yanukovych at Southern Russian city of Rostov-on-don is that: "Russia is the Declarer, Viktor Yanukovych is just a Putin's Card". The United States and EU are very carefully to wait for the Ukraine's Orange democracy's Yulia Tymoshenko will fly to Capital Hill, Washington, DC to set hearing and discuss the NEW Ukrainian government & NEW Cabinet's policy before to provide IMF aid decision and Votes. Because not only Ukraine has crisis, the USA's Detroit bankruptcy and (D) Barack Obama's $17 Trillion Bad-debt ceiling are Americans facing crisis and headache are unsolved domestic affairs as well.